In the second half of 1918, a series of victories for the Allied forces and significant advances on German held territory led to the feeling that the war was finally coming to a close. A German delegation and the Allied Supreme Commander Ferdinand Foch negotiated the final armistice on 8 November 1918. They met in a snowy forest 50 kilometres from battle-lines that had shifted little in four years of fighting. The armistice came into effect at on 11 November 1918. No fuss was made by the boys. Everybody went on working as usual. ‘The war is over,’ someone said, but no more notice was taken than if someone said, ‘There is no parade today’. Not that there was not joy in everyone’s heart, the glint in the eye showed that […] Perhaps it was hard to realise that nobody sought another’s life, that the beautiful moonlight did not mean horror and death poured from the sky, that men could now live naturally. 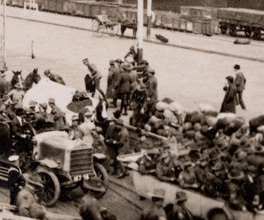 The large number of troops meant that most soldiers would not get home until 1919. As they endured the wait for a seat on a ship home, the Allies established training centres using French factories and encouraged men to pursue trades and further education. The Spanish Flu outbreak at the end of the war also led to deaths but Australia's relative isolation and quarantine procedures meant that casualties were less severe than in other regions of the world. For some men the hardest adjustments were those of the mind. In the cities there was an upsurge of violence and drunkenness in 1919 [...] Men [...] were trying to forget, to blot out the gruesome sights and the waste of a horrible past. Politicians and journalists spoke of a nation that had grown up, or found its soul; sentiments which glossed over the loss of 60,000 of the country’s young men. Three times that number had suffered significant injury. A stark split arose between those who had done their duty and those who had ‘shirked’ it. In June 1916, the Returned Sailors and Soldiers Imperial League of Australia (now the Returned and Services League or RSL) was established. The RSL defended the rights of those who served and advocated on behalf of soldiers who had problems returning into society. In the years after the war the RSL was criticised for holding onto an imperial, conservative vision of the world, and many veterans chose not to join their local branch, or only did so many years after their return. A thankful nation rewarded the sacrifice soldiers had made with the Soldier Settlement Scheme, in which veterans were given small grants of agricultural land. State Governments saw an opportunity to have more of Australia’s land made productive. In Victoria almost 12,000 soldiers took advantage of the scheme. It was a success for some farmers but many were frustrated by the size and quality of the land they had been allocated and the inadequacy of the loans available to improve their farms. The only possible answer is that fighting is more important to the life of nations than farming or legislating, labouring, teaching, nurturing children or any other of the innumerable, unspectacular activities of civil society. Lake, M & Reynolds, H 2010, What's wrong with Anzac? UNSW press, Sydney, N.S.W. After a disastrous landing at Anzac Cove, a legacy was salvaged by a successful retreat and evacuation.